In a small span of time we received lots of love from the society, and Viking Steel Structures team is grateful to that. We believe that we rise by lifting others! This leads us to collaborate with non-profit organization Susan G. Komen Northwest NC and give back to the society in form of small contribution. Viking Steel Structures has joined hands to support the Breast Cancer patients. 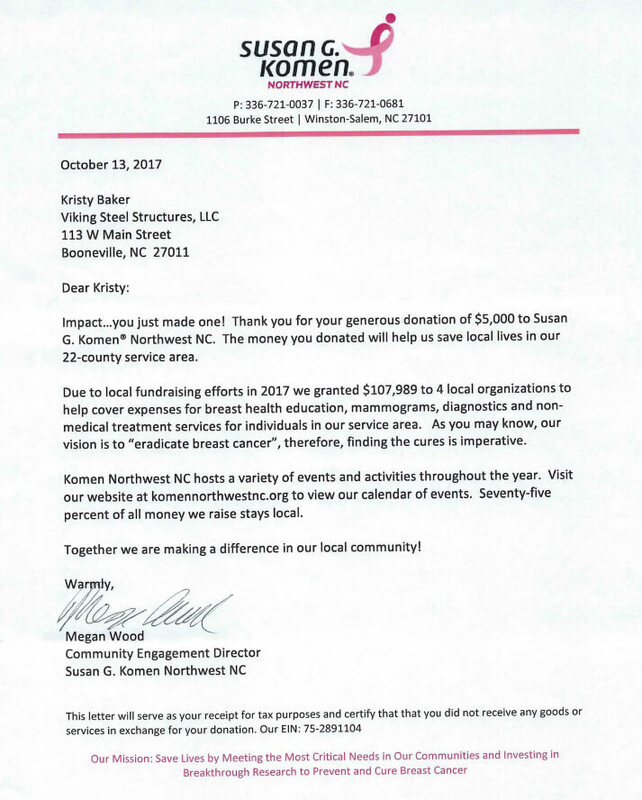 A part of earnings from each sale during the month of October has been donated to Komen Northwest NC. Susan G. Komen Breast Cancer Foundation in beloved memory of Susan Goodman Komen (Her elder sister, who died due to breast cancer) in 1982. Since 1982 foundation has spent nearly $1.5 billion for breast cancer research, education, screening and treatment. Why Susan G. Komen Northwest NC? Visit Susan G. Komen Northwest for more information about them!